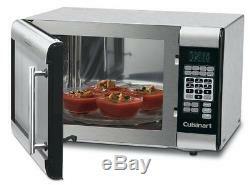 Cuisinart CMW-100 1-Cubic-Foot Stainless Steel Microwave Oven. &###x2022; 1000-watt stainless-steel microwave oven with 1-cubic-foot interior. &###x2022; &###xA0;Touchpad controls with LCD; 25 preprogrammed settings; 10 power levels. &###x2022; &###xA0;8 presets with serving-size options; 2-stage cooking operation. &###x2022; &###xA0;2 defrost functions; 12-inch glass turntable; instructions and recipes included. &###x2022; &###xA0;Product Built to North American Electrical Standards Weight:33.5 pounds; Dimensions:20.50" x 15.25" x 12.80 1000-watt stainless-steel microwave oven with 1-cubic-foot interior Touchpad controls with LCD; 25 preprogrammed settings; 10 power levels 8 presets with serving-size options; 2-stage cooking operation 2 defrost functions; 12-inch glass turntable; instructions and recipes included Product Built to North American Electrical Standards. A stainless steel interior and 24 preprogrammed settings put the Cuisinart Microwave Oven in a class all its own. The ideal cooking environment, nonporous stainless will not absorb orders, moisture or food particles. Preprogrammed one-touch controls quarantine that everything from reheating coffee, to defrosting cutlets, to cooking fish or making 2, 4, or 6 strips of crispy bacon will be done right. This 1000-watt, 1.0-cubic-foot oven lets you cook from scratch, and do it a little healthier without any oil or butter. With its stainless steel interior, stainless steel door and sleek control panel, this is a new generation of microwave - from Cuisinart, of course! We accept payments by any of the following methods. Please pay as soon as possible so that we can post your product to you sooner! If you need to cancel an order or make any changes to it, please contact our Customer Care Department as soon as possible. Samis Shop is committed to providing each customer with the highest standard of customer service. We have outlined below our Standard Return and Damaged and Defective Items policies. If you have any questions or concerns about these policies, please contact our Customer Care Department. There are a few exceptions to this policy. Grocery Items Health & Beauty Consumables Pet Food HazMat Items Power Tools Items with Lithium Batteries Furnace Filters Chimney/Stove Pipes & Flashing Bulk Bagged Granular Products e. Rock salt, sand, cat litter, etc. Damaged, Defective or Incorrect Items. First of all, we're sorry that happened. Let us help you in every way we can&###x200B;&###x200B;&###x200B;&###x200B;&###x200B;&###x200B;&##x200B. Photos of defective or damaged items are likely required. Your Customer Care Specialist will guide you through the process. This was great arrived very quickly. &###xA0;&###xA0; &###xA0;th (845&###x2605;). CLC Rain Wear R23010 Over The Sock Black PVC Men's Rain Boot, Size 10 (#162423690329). A++++ &###x1F600;&###xA0;&###xA0; &###xA0;ee (163&###x2605;). OXO Good Grips Dish Brush Replacement Brush (#162223229738). The item "Cuisinart CMW-100 1-Cubic-Foot Stainless Steel Microwave Oven" is in sale since Monday, October 10, 2016. This item is in the category "Home & Garden\Major Appliances\Microwave Ovens". The seller is "hardwareny" and is located in Middletown, New York. This item can be shipped to United States, Canada, United Kingdom, Denmark, Romania, Slovakia, Bulgaria, Czech republic, Finland, Hungary, Latvia, Lithuania, Malta, Estonia, Australia, Greece, Portugal, Cyprus, Slovenia, Japan, China, Sweden, South Korea, Indonesia, Taiwan, South africa, Thailand, Belgium, France, Hong Kong, Ireland, Netherlands, Poland, Spain, Italy, Germany, Austria, Israel, Mexico, New Zealand, Philippines, Singapore, Switzerland, Norway, Saudi arabia, Ukraine, United arab emirates, Qatar, Kuwait, Bahrain, Croatia, Brazil, Chile, Colombia, Costa rica, Panama, Trinidad and tobago, Guatemala, Honduras, Jamaica, Antigua and barbuda, Aruba, Belize, Dominica, Grenada, Saint kitts and nevis, Saint lucia, Montserrat, Turks and caicos islands, Barbados, Bangladesh, Bermuda, Brunei darussalam, Bolivia, Ecuador, Egypt, French guiana, Guernsey, Gibraltar, Guadeloupe, Iceland, Jersey, Jordan, Cambodia, Cayman islands, Liechtenstein, Sri lanka, Luxembourg, Monaco, Macao, Martinique, Maldives, Nicaragua, Oman, Peru, Pakistan, Paraguay, Reunion.